… they go out like a bull. For the readers of my February 28 asset class summary, you may recall my play on the old adage of March coming in like a lion and going out like a lamb. But there was no change in the direction of broad equity markets for the month of March, though small caps were weak. Corporate bonds and REITs also benefited from the large drop in rates. 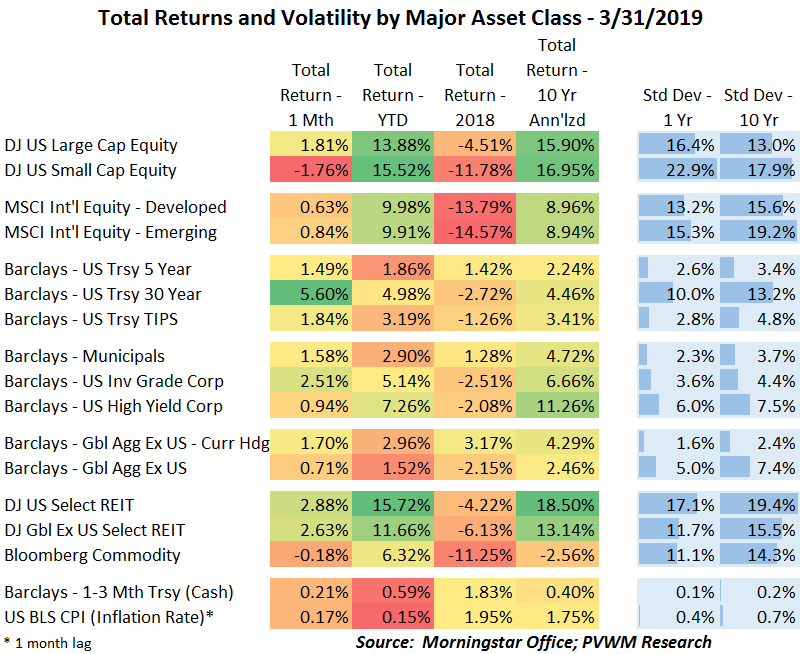 In fact, US REITs have the largest YTD gain across the major asset classes in the table, something I did not expect at the beginning of the year, and also something that can turn quickly if rates reverse course. With the equity markets, US large caps continued the strong trend higher on the back of an accommodative Fed and technology resurgence. Small caps didn’t fare as well, as some investors worried about an upcoming recession and its impact on domestic companies. These concerns – perhaps overblown – were driven by the 3m/10year curve inversion (short rates higher than long) and reiteration of the Fed’s patient stance. At the sector level, financials were down over 2.5% for the month due to falling rates and impact on net margin. Global equities keep plugging along, despite the ongoing Brexit challenges and trade negotiations. On the economic front (in addition to the Fed activity), the number of jobs created was low but the unemployment rate dropped back to 3.8% and wage inflation continued to rise, bringing the yearly change to +3.4%. However, broader inflation measures remain in check for now. Inflation measures and Fed speakers bear continued monitoring.